No review was written by the reader because this set is just too epic for words. Mega thanks to Justin for bringing this to my attention. Much better to review this than the little wittle review I wrote for the first book in the series. P.S. : I found a better review of it here. I use to read these books to my second graders. They are wonderful mysteries and really inspired my reluctant readers to grab a book! I read these books in younger grades and I just loved them! They were so addicting! These are only on my Goodreads board for my future kids! I am in loooove with these books!!!!!!! This book series was one of my absolute favorites from my childhood, and some of the stories still stick with me to this day. Each story actually had a very good mystery and how the team of kids in the books solved it. This story definitely demonstrates teamwork and problem solving the most. 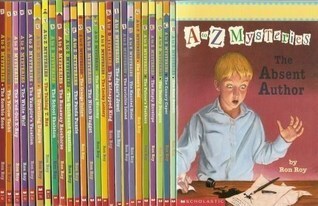 I think these books are perfect mysteries for older aged elementary children. A great series for the new reader. Troy, at 8, burned through these books in a couple of weeks, he was reading 1 a day. The story line, for the most part, moves quickly and is well developed. The heros are interesting and loveable, and the books are short enough to not be intimidating. A great choice for kids! The boys sat still night after night for these. We read one right after another and they couldn't get enough.But really, what's up with children's books using the word "said" about 15 times/page? Drives me batty. My 8 year old daughter discovered this series on her own. She loved the series so much she ask for the entire series for her main Christmas present. Now that's a recommendation! I ADORED these books when I was growing up!! Fun reads especially for younger kids (elementary school level). I absolutely love these books! A wonderful short book(s) to always go back to and read. Ethan, Eli and myself have read these books at bedtime. We all love them. They are short enough to keep the boys interest and lots of fun! Ron Roy - Full name: Wallace Ronald RoyMost known for the children's mystery series "A-Z Mysteries" and "Calendar Mysteries"